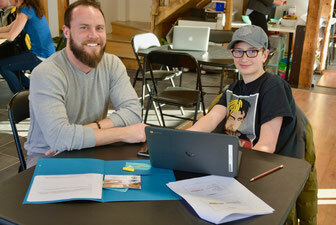 Nick White has been working as a practicum student with Phelps Helps for our high school tutoring program since January. For this edition of the Border Report, we wanted to hear about his experience. 1) What are you studying at Bishops’ University? Phelps is the placement I chose for my 4th year Practicum class where I have the opportunity to put some of the skills I have learned in my Psychology courses into practice. Other students in my class have placements at Alexander Galt, the CHUS, and various other locations around the Eastern Townships. Some of their placements are more observational in nature, so I consider myself fortunate to be able to use some of the skills I have learned while at Bishop's. 3) Why did you choose to do your practicum at Phelps? I chose Phelps because my father was born here in Stanstead and I wanted to be able to use some of my experiences to help the community where he grew up. I also still have uncles and aunts in the area who I like to visit when I have the time. 4) What do you like best about Phelps' High School Tutoring Program? The kids are all a lot of fun and nothing beats the feeling you get when a student tells you of a good grade they received on a project that you helped them with. 5) Do you plan to continue volunteering after your practicum?